Q: Why should I volunteer? A: There is a dire need for volunteers. About 70% of the nation’s firefighters are volunteers. They are not paid for their services. They volunteer for many reasons: they want to protect and serve their community, they receive a great deal of personal satisfaction from helping others, they feel compelled to give back to their community, they are following in a family tradition, and the list of reasons goes on. Q: Do I need experience? How will I learn what to do? A: No experience is required. The Company trains all volunteers and provides recruits with the equipment necessary to perform their duties safely and professionally. If you are dedicated, courageous and have a desire to give back to your community, Lafayette Fire Company wants you! A: Lafayette Fire volunteers are not paid for their services, but the rewarding experience of helping others in priceless. Q: How much time is required of volunteers? A: As a volunteer, you are asked to give only as much time as you can. There are many positions available, whether as an active firefighter or helping around the station. All tasks are equally important and all contribute to the safety and well-being of the community. Q: What are the age restrictions for volunteers? A: In order to become a firefighter, you must be at least 18 years old. However, there are positions available for Junior Firefighters who are 14-17. There are no maximum age restrictions for becoming a volunteer. Q: Is equipment provided to me? A: Yes, all of the equipment used during training and while on the job is provided free of charge. Q: What if I don’t want to fight fires? A: If the idea of volunteering with the company interests you but you are apprehensive about fighting fires, there are other positions available. 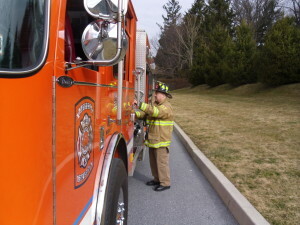 Q: Why do Lafayette Fire Company volunteer their services? A: The reasons for volunteering are many. We listened to our volunteers and below is a brief listing of reasons why they invest their time and energy into firefighting. I receive satisfaction knowing that I play a key role in keeping family and friends safe. I learn new skills that help me in all areas of my life…even preparing me to find a new career! I am a member of a team that shares the same need to help others and we have many interests in common. My fellow volunteers are like family: We share a strong bond. I am following in a proud tradition of service. The impact you have on individuals and the community is strong. Volunteering is a great way to help others and get involved in the community.